An excerpt from the Taccle2 handbook for Primary teachers. You can download all of the books for free from the Taccle2 website. WolframAlpha is a search engine that works completely differently from, say, Google. [] Whereas other search engines will provide reams and reams of results in the form of web pages, many of them too detailed and difficult for learners to read and extract what they want, results on WolframAlpha are clearer and much less wordy. It is also a good idea to get children used to the idea that there are different sorts of search engine. This scientific search engine is great for learners who want information and data on specific, ‘technical’ themes e.g. countries, animals, famous people, materials. For example, you may want them to write a project on the countries in the European Union, or to collect data specifically on one topic for a maths lesson e.g. populations of the countries in Europe. Begin by asking learners to go to the WolframAlpha homepage. Then ask them to type a keyword, question or maths equation into the box beneath ‘Enter what you want to calculate or know about’. Click on the ‘=’ to get their results. WolframAlpha will give the results of different meanings of the word e.g. if you type ‘France’ you will be given information and data relating to the country e.g. flag, location on a map, population etc. However, it will also give you alternative meanings you can search on e.g. ‘a given name’. Clicking on this will load a different page and a different result. In this example, it gives an outline of ‘France’ as a ‘female given name in the US’. The word ‘banana’ is another good one to try – it gives about 5 or 6 different definitions of the word and you can search on any of them with surprising results. We also like the little fun questions that pop out of the left hand side of the screen. You can click on them to get the answers. Pupils will need a very quick tutorial – max 10 mins! 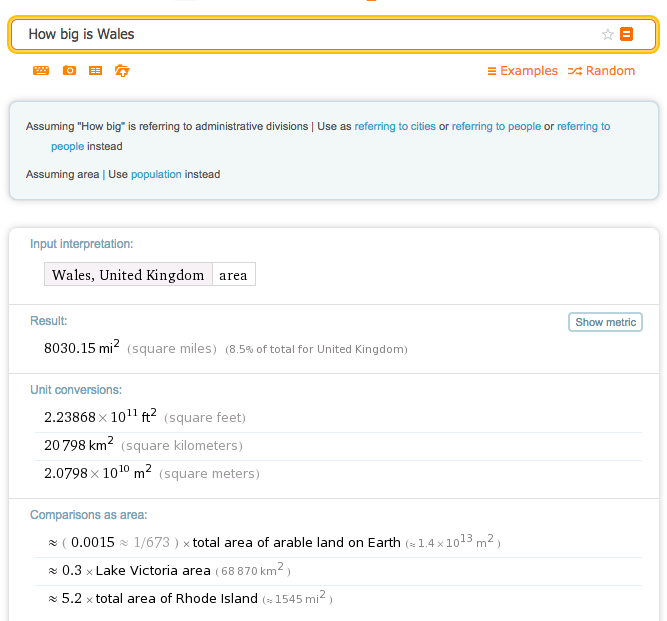 Wolfram Alpha is a Computational Search Engine – it computes the answer from separate items of data rather than giving you a list of web pages that might have useful information. Google is a Semantic Search Engine that takes the text you type in and ‘matches’ it against the key words on a web site. More ideas from our Taccle2 Handbooks for teachers, I couldn’t pass up an excuse to get Tom Lehrer on the Pontydysgu website! Mark Rosengarten has recorded a lot of chemistry tutorials and songs. One of our favourites is “It’s a family thing” a song about a list of organic molecules. It’s great to use at the end of the lesson so that you can end the lesson on a high. You can also give students the link to use the song as a revision aid. Watch out for humming during exams! The other classic song (which may only be familiar to those of us of a certain age) is Tom Lehrer’s ‘Elements Song’. Some versions have pictures of the elements for added interest. Or you can find a version with words. Divide the class into groups and let them have an impromptu karaoke session – can they keep up with him? A lyrics sheet may nelp! Total chaos but fun. Divide your class into groups and ask them to write their own song about something they are learning in chemistry. Create a podcast using Audacity (or GarageBand on a Mac). If you don’t feel confident about that, make a PowerPoint and add a voice over. Or use Helloslide or Knovio. All of the Taccle2 handbooks are available to download for free from the Taccle2 website. Over the coming weeks I’m going to share some practical ideas from the Taccle2 Handbooks on e-learning for teachers of Primary, STEM, Humanities, Creative and Performing Arts and Key Skills. Here are some ideas for exploring How Science Works. Find present day scientists on Linked-In or academia.edu or MyExperiment. What research are they doing right now? Create a class blog where students can record what they have learned and use the comments to discuss who was the most important scientist in history. Talking of debates, check out aMap to start an argument. Students follow the on-screen instructions in order to join an existing argument or start a new argument. They’ll have to provide an email address, name and location but you can use the same email for multiple users. They are prompted to add reasons and supporting evidence for their argument. When they have finished they get an embeddable mind map which others can reply to by creating their own “argument map”. See the Taccle2 blog for an example. This week we are in Brussels for the final meeting and conference of the Taccle2 project. More info and ideas to come but for now, here’s a sneak peek of what went on! Always on the lookout for practical ways to use technology in the classroom, Pontydysgu were scoping out new ideas at Bett 2014. We liked the new Lego storytelling kit. One set gives you a tray of Lego bits, there are minifigs, cats, frogs, brooms, Christmas trees and more. You also get a book of lesson plans and ides and the accompanying software. There’s also a spinner to help choose a genre or character for storytelling inspiration. The idea is that children work in groups to tell a story, each group has a kit with enough lego bits to recreate the same scene 5 times only each one is slightly different as their stories progress. They then take photos of their scenes and upload them to a computer where they can drag and drop the photos into a comic strip style template, add backgrounds and captions and print their story. The software is nice and simple to use, the lego kit has been carefully selected for optimum storyline coverage and it has the lego brand – guaranteed to spark some interest in even the most reluctant of storytellers. A collection of small-world-play or dolls house characters and accessories. A camera/ webcam/ cameraphone with the ability to transfer your photos to a computer. An app or web based tool for comic strip creation using photographs. Toondoo – Free- You need to create account but it is easy to do. Upload photos, edit, cut shapes out and save, then go to cartoon creator, choose comic strip layout and you can put your own images into a cartoon, choose layout template, drag and drop backgrounds and cliparts, callouts and thought bubbles to create a story. Comic Life – Cost £11.99 for a single user license or £1,049 for a site license. Comic touch – Free – From the creators of comic life this App cartoonises one photo at a time with no comic strip mode so you would have to print them and reassemble into a comic strip or download the pictures after editing and then use a different tool to put your story together.